Despite common beliefs that Pitbulls are dangerous and fighting dogs, people who own them know them as loyal and loving companions. This is a highly active breed, that is known for its intelligence, friendliness, playfulness, and devotion for its owner. This medium-sized breed with its muscular body was developed in order to bait bears and bulls into the ring. Unfortunately, their strength and body appearance was the reason why they are used in dog fights. Pitbulls are highly active and playful dogs that burn a lot of energy and in order to sustain their body and help with their development, they require proper nutrition. Many owners aren’t aware that when compared to other medium-sized and large breeds, Pitbulls need a balanced diet that is high in all the right macronutrients and has all necessary micronutrients. We did an extensive research on this subject in order to help you find the best dog food for Pitbulls. Wellness is one of the leading brands when it comes to making high-quality dog food from right ingredients. They have several lines that are designed to meet the nutritional needs of any dog, no matter how old, active, overweight or underweight he is. This grain-free free formula is a real protein powerhouse and with 80% more meat than other dog foods this is our pick for best dog food for Pitbulls to gain muscle. This CORE formula contains 34% of crude proteins that are derivare from high-quality meat sources. Deboned turkey is the first ingredient followed by Turkey meal and Chicken meal that are packed with good quality proteins. Since Pitbulls are high energy and very active you know that they need higher levels of fat than other breeds. This formula contains a minimum of 16% crude fats which is a nice amount to satisfy all the needs of moderately active Pitbull. Chicken fat, ground flaxseed, and salmon oil are the main and healthy sources of fat for every Pitbull. Fat makes your dog’s skin and coat look and feels nice, and these ingredients are perfect for Pitbulls as a breed who is prone to develop allergies and skin problems. The most important feature is that this is grain-free formula which makes it appropriate for dogs who have skin problems and food allergies. Your dog will fill his belly with healthy carbohydrates like peas, potatoes, ground potatoes, spinach and broccoli. And to top everything off Wellness included all the necessary vitamins from healthy fruits like apples and blueberries. And this formula contains all the necessary minerals like Phosphorus and Calcium for healthy and strong bones and joints. 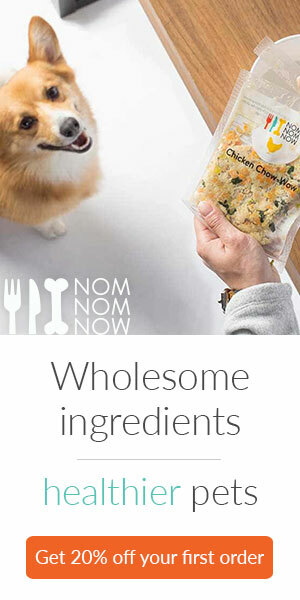 This brand believes that every dog should have a diet rich in proteins from different meat sources, just like their ancestors wolves have. With a formula made from roasted bison and roasted venison, you will give just that to your Pitbull dog. The great thing with this brand is that they have a High Prairie formula that is specially made with smaller bites and provides an excellent nutritional balance for dog food for Pitbull puppies to eat. When it comes to adult Pitbulls this formula is a great choice since contains 32% of crude protein that is derived from buffalo, roasted bison and venison, chicken and lamb meal. These are all high-quality meat ingredients that will provide a variety of tastes that your dog will love. With so many meat sources comes a higher amount of fat and this formula has a perfect amount of a minimum 18% of crude fat that will give plenty of energy to an active Pitbull dogs. Canola oil will maintain your dog’s coat and skin in perfect condition. One more great feature is that this is a grain-free formula that is appropriate for dogs who are suffering from food allergies. Healthy carbohydrates like sweet potatoes, peas, tomatoes are easy to digest and suitable for Pitbulls who have digestive problems. Like all high-quality formulas, this one also has all the necessary fruits as a source of vitamins and antioxidants. All the necessary minerals like zinc and selenium are there to make this food suitable for everyday feeding. This formula contains 3719 kcal/kg or 370 kcal/cup, so make sure that your dog gets enough food according to his activity level and age. This grain-free food formula form Castor and Pollux is a top rated dog food for Pitbulls to gain weight. With high-quality ingredients, all the necessary vitamins and minerals this is well-balanced food for everyday feeding. The great thing about his formula is that it contains 38% of crude protein and has a variety of meat sources that will make this food your dog’s favorite choice. The main ingredient duck is followed with Turkey meal, Chicken, Lamb meal and Salmon meal. These are high-quality ingredient and the first five on the label are all sources of protein, so with this formula, you don’t have to worry if your dog will stay fit, he will be fitter and stronger. With a minimum of 17% crude fat, this is a well-balanced food for an energetic Pitbulls. Since this is also a grain-free formula, you can feed it to a Pitbull who has skin problem and food allergies. The easily digestible carbohydrate like sweet potatoes and peas are good for dogs who have problems with bloating and digestion. All natural ingredients are accompanied with probiotic that helps with digestion, antioxidants and omega 3 and 6 fatty acids that will maintain your Pitbull’s coat in pristine condition. This is a high-calorie dog food that contains 3740 kcal/kg or 460 kcal/cup and will keep your dog’s belly full with good quality natural ingredients. Feed your Pitbull with recommended amounts of food divided into several smaller meals. Great Plains Feast formula is specially created to fulfill the dog’s natural dietary needs for diversity in meat sources. For a moderate price, you will get a high-quality dog food that contains all the necessary nutrients for a everyday feeding. The first ingredient of this nutritious food for Pitbulls is a Bison meal that is a source of lean red meat and contains high levels of proteins. With 34% of crude proteins, this formula also contains Lamb meal that will fulfill your Pitbull’s needs for meaty flavor. When it comes to carbohydrates, this is a grain and gluten-free formula that is suitable for dogs with skin problems and all Pitbulls since they can easily develop food allergies. Easily digestible tapioca and peas will keep your dog’s belly full but won’t provoke allergies. One more great feature for all dog owners who are shopping for a new Pitbull food is that this formula contains a minimum of 18% crude fat. This is a great amount that will keep your dog full of energy and Canola oil and flaxseed will maintain the state of your dog’s skin and coat. With guaranteed levels of antioxidants like Vitamin E and Vitamin C that will keep your dog’s immune system in pristine state, this formula is a great choice for balanced everyday diet. Omega 3 and 6 fatty acids will improve the skin condition of dogs who have allergies. This is a high-calorie formula that will keep your Pitbull active and full of energy. This food contains 3675 kcal/kg or 430 kcal/cup that needs to be served in several smaller meals. This is a high-quality dehydrated dog food that is made with whole fresh ingredients that are suitable for human consumption. With this level of quality comes a big price that isn’t suitable for everyone, but if you have means to afford it you will know exactly what your dog is eating. This formula contains 31% crude proteins, and the main ingredient and source of meat is beef. Since all the ingredients in this formula are dehydrated, the brand claims that 10lb box of this food contains 16 pounds of ranch raised beef. The main source of fat in this formula is organic flaxseed oil that will provide 14% of crude fat and will keep your Pitbull active and full of energy. Also, flaxseed will keep your dog’s skin and coat in perfect condition. This is a grain-free formula that is appropriate for all life stages and pregnant dogs. With easily digestible sweet potatoes and potatoes, you can be sure that your dog will not have any gases or digestion problems. This formula also has cranberries, papaya, and pumpkin honey that provide all the necessary vitamins for a healthy immune system. Calcium and Phosphorus are just two of many minerals that are there to make this formula suitable for daily consumption. Since this is a dehydrated dog food before you serve it to your dog you need to add a little warm water, stir it and after 3 minutes serve it to your dog. If you buy a 10 lb box of this dehydrated dog food you will get 40 lb once it is soaked in water. How To Find The Best Dog Food For Pitbulls? Pitbulls are very energetic dogs that need to have a well-balanced diet that is high in protein, rich in fats and its grain-free since they are prone to allergies and bloating. They need to eat high-quality dog food, but the good news for all owners is that here you will find an affordable dog food for Pitbulls that will provide the required nutritional balance. How Many Calories Do Pitbulls Need? Pitbulls are medium-sized and muscular dogs that are highly active and energetic and require a lot of calories to fuel them. And average Pitbull weigh 40 pounds but adult males can have up to 70 pounds. All Pitbulls need a lot of food to sustain them, but the calorie requirement of your dog depends on his age and activity level. To calculate the exact needs of your Pitbull use a dog calorie calcu. – Average Adult Pitbulls requires 30 calories per a pound of body weight, so for a dog that weighs around 35 pounds that is 1050 calories. This number can go up or down depending on the weight of your dog. – Active/ Young Dogs will need much more food on a daily basis. If you have a very active dog or a young Pitbull, they will have to eat around 1700 calories. – Older Dogs are less active and more prone to become overweight and develop other health problems so they need to eat less. The recommendation for older or less active dogs is 875 calories. How Much Do Pitbulls Eat? When you look at the calorie requirement for Pitbulls it is immediately clear that this breed needs a lot of food in order to sustain their basic needs. It is best for Pitbulls to eat high-quality dry dog food, but they can also benefit from the raw diet. This breed is known for its ability to devour its meal in record time, and this is a reason why many Pitbulls have sensitive stomach and problems with bloating. Also, you should give your dog 30 minutes to eat his food and then remove its bowl, and wait one hour after the meal for any activities. To prevent stomach problems and bloating it is best to feed your dog with grain-free food and divide the meal for an adult Pitbulls into two smaller ones, puppies and active dogs can have three or more meals per day. What Kind Of Diet Is Best For Pitbulls? Like with any other breed Pitbulls need to have a balanced diet that needs to consists form protein, fats, carbohydrates, vitamins, and minerals. Since this breed is active and muscular they need to eat high protein dog food to maintain their health and be fit. How Many Proteins Do Pitbulls Need? Since this is a highly energetic and active breed they need more proteins than other dog breeds. An adult Pitbull needs to eat food that contains 25 to 30 percent proteins. The diet of more active Pitbulls should include as much as 40 to 50 percent of proteins. When you are looking for the best dog food for Pitbull you should also pay attention to the ingredients listed. They should be high-quality and contain two to three meat sources listed in the list of ingredients. Chicken, fish, beef, and turkey are all good choices of meat for Pitbull to eat, and meat meals are a concentrated whole meat that contain higher levels of proteins. You should avoid any meat by-products, and meat meals from unknown origin. They are also a source of protein, but ingredients used are not high-quality and can lead to health problems. How Many Fats Do Pitbulls Need? Fat is the main source of energy in dog food and also a reason why dog foods are so tasty. Pitbulls with allergies can benefit from the diet that has larger amounts of fat since it is good for skin and coat. Many owners are careful when they are looking for best dog food brands for Pitbulls and their fat levels. But compared to other breeds that need 10 to 12 percents fat in their diets, Pitbulls need 15 to 25 percents in order to stay healthy. The amount of fat your Pitbull will need depends on how much active he is. Very active, puppies and younger dogs need higher amounts of fat as a source of energy. The best sources of fat for Pitbulls are chicken fat, flaxseed, and fish oil. How Many Carbohydrates Do Pitbulls Need? From all ingredients necessary for Pitbulls to stay healthy and strong the best dog food for Pitbulls should contain low to moderate levels of carbohydrates. A high carb diet can lead to stomach problems like diarrhea and cause allergies. Pitbull puppies and younger dogs need to have 25 to 30 percent of carbohydrates in their diet, this amount combined properly with other nutrients will help Pitbull puppies to gain weight. Adult Pitbulls should have 20% carbohydrates in their diet. And since Pitbulls have tendencies to develop allergies it is important to always choose a dog food that is grain-free. This type of foods have enough carbohydrates that are healthy and will give energy and prevent the loss of muscle mass in your dog. What Are The Common Health Problems In Pitbulls? Just like other dog breeds, Pitbulls are also prone to develop some health problems. Pitbulls more often suffer from allergies and bloating, and these conditions occur when they don’t eat the right ingredients. Skin Allergies: Pitbulls can suffer from skin irritations that can be triggered by fleas, seasonal allergies or food allergies. If your Pitbull is suffering from food allergies you may be wondering what is the best dog food for Pitbulls who are suffering from this condition? Since Pitbull are ravenous when it comes to their food and they tend to just swallow it without chewing, it is best for your dog to have a few smaller meals. Adult Pitbull should have at least two meals, puppies and more active dogs three or more. Dividing your Pitbull’s meals into a few smaller ones and taking the bowl after 30 minutes will prevent digestion problems and bloating. Now that you know what are the nutritional needs of this breed, we will tell you what kind of dog food is best for Pitbulls. And to help everyone find the perfect food for their dog no matter what they budget are we reviewed 5 dog foods that have everything that a Pitbull needs. Since Pitbulls are very energetic and active dogs they need a different food compared to other medium-sized breeds. As an owner it is your duty to find the best dog food for Pitbull, that is high in meat-based proteins, has enough fats and its grain free. If you Pitbull needs to gain weight and muscle mass you can check our article about Best dog food for weight gain. Before you do that consult your veterinarian to see if your dog can benefit from this type of diet. It is especially important for all Pitbull owners to buy high-quality dog food with natural ingredients since Pitbulls that are eating low quality cheaper food can develop food allergies. These dogs have different nutritional requirements compared to other breeds, it’s up to you to fulfill them.